Continuous processing has been a mainstay in process industries for decades, but is conspicuously rare in the manufacture of biopharmaceuticals. Continuous processing is progressing slowly, cautiously, in a way that is reminiscent of single-use bioprocessing 15 years ago. “We’re seeing a greater appreciation for continuity, and many are starting by implementing islands of continuous processing within the larger batch bioprocess,” notes Loe Cameron, director of analytics and controls at Pall. Biomanufacturers are investigating continuous unit operations (both upstream and downstream), connecting two consecutive operations (e.g., cell culture and clarification), or combining downstream steps. “This entry level of continuous processing has been critical for manufacturers to understand these processes more completely from the perspective of automation, orchestrating the connection between unit ops and the overall process dynamics,” Cameron says. Bind/elute chromatography is difficult in continuous mode due to the discrete loading, washing, elution, and regeneration steps. With multiple columns, one column can be at one point in the process while another is doing something else. But multiple-column systems are complex to install and control—which is why Andrew Bulpin, head of process solutions at MilliporeSigma, believes that flow-through chromatography is a more appropriate entry point for continuous purification. Depth filters—a flow-through step based on diatomaceous earth or activated carbon—are underappreciated for their size-exclusion and absorptive capabilities. In addition, flow-through chromatography provides unique purification, particularly through the combination of multiple media with orthogonal separations. MilliporeSigma has demonstrated how these two modes may be used together to clear host-cell proteins (HCPs), antibody fragments, and low-molecular-weight impurities from solutions of monoclonal antibodies (mAbs). Recoveries higher than 85% and reduction of HCPs to below 10 ppm suggest that the flow-through approach may be adapted to existing (and new) mAb downstream operations without compromising quality or process economics. For example, MilliporeSigma’s CR40 carbon-based depth filter removes HCPs, DNA, leached Protein A, mAb fragments, cell culture media components, and other impurities. In a study published that year, researchers demonstrated that a combination of anion- and cation-exchange columns work for the flow-through chromatography component. Combined, the ion-exchange media are expected to clear leached Protein A, protein aggregates, HCPs, DNA, and virus to levels acceptable for lot release. The collaboration between LEWA, whose specialty is precision pumps and systems for biopharmaceutical production, and ChromaCon (continuous chromatography) illustrates the breadth of expertise demanded for large-scale implementation of continuous purification. ChromaCon AG holds patents for CaptureSMB® (2C–PCC), a two-column continuous chromatography process with dynamic process control, and markets the Contichrom® CUBE benchtop two-column fast protein liquid chromatography (FPLC) lab-scale purification systems. Contichrom CUBE runs CaptureSMB and two other twin column countercurrent processes for polishing membranes and columns, in addition to two-step connected batch and traditional single-column batch purification. CaptureSMB (“capture” using “simulated moving bed” technology) was developed by ChromaCon, and ETH Zürich is validating CaptureSMB and other continuous bioprocess technologies in the context of end-to-end continuous integrated bioprocessing of mAbs. CaptureSMB performance relies on the optimized timing of subprocesses using just two columns. Other systems, with three to eight columns, are less flexible in terms of flow rates, and they use more complex hardware. CaptureSMB-based processes rapidly achieve steady state by the time material exits the first column. Dynamic process control, AutomAb®, is embedded in CUBE’s process-control software to keep processes at optimal set points. EcoPrime® Twin LPLC, the family of chromatography systems by LEWA, also uses the CaptureSMB twin-column approach (under license from ChromaCon) for manufacturing-scale GMP processes. Like Contichrom CUBE, EcoPrime Twin performs traditional batch chromatography, with one column or two columns in series, and incorporates an in-line dilution option for preparation of point-of-use buffers from concentrates. Together, Contichrom CUBE and EcoPrime Twin represent a complete scale-up platform for continuous chromatography, from bench to production. “Because steady state is achieved almost immediately, the bench-scale and production systems perform nearly identically, which allows great confidence in scale up,” says Gerard Gach, chief marketing officer at LEWA-Nikkiso America. Recent LEWA studies1 comparing batch and continuous capture of equivalent process volumes, showed process times of four hours for continuous processing vs. nine hours for batch capture. Specific productivity, measured as grams of product per liter of resin per hour, is up to threefold higher for continuous capture with both Contichrom and EcoPrime Twin compared with batch chromatography, and total buffer consumption was 20–50% lower relative to batch capture. “Little process development work was done to accomplish a nearly optimized run,” Gach adds. EcoPrime Twin may be optimized for either shorter process time or improved resin utilization. LEWA estimates that for a 100-kg batch at 1g/L titer, approximately $900,000 in resin costs, or 22 days of process time for a comparably sized upstream culture, can be saved. A side-by-side comparison on a 5 g/L-titer mAb process stream showed nearly identical benefits for EcoPrime Twin and Contichrom CUBE. Thus, the lab-scale experiments can be used to accurately predict the scaled-up process performance. Continuous capture processes may be carried out at GMP scale with LEWA’s EcoPrime Twin, which is built on ChromaCon’s Contichrom® CUBE technology. During batch mAb capture with Protein A resins, antibody loads onto columns at well below total resin capacity to prevent sample breakthrough and subsequent product loss. Scientists at GE Healthcare have demonstrated that continuous capture through periodic countercurrent chromatography (PCC) increases resin utilization through loading levels that are significantly higher than in batch processing. But as columns are loaded beyond breakthrough, resin lifetimes may be shortened as a result of fouling, for example, thus attenuating a major benefit of downstream continuous processing. Considering the large sample loads when running in PCC mode, precipitation of HCPs and fouling could further degrade performance. “Protein-ligand degradation can also arise from repetitive alkaline treatment during cleaning-in-place, or degradation from proteases from the feed material during sample loading,” says Mats Gruvegard, bioprocess downstream senior marketing manager at GE Healthcare. A recent GE study demonstrated2 that more than 175 cycles of PCC performs similarly to a conventional high-capacity resin during continuous capture. Specifically, MabSelect SuRe PCC affinity resin offers high binding capacity at shorter residence times, making it well suited for applications requiring fast mass transfer such as mAb capture in a continuous process. The resin is based on a high-flow agarose base matrix with average bead size of 50 μm. Bottom line: PCC capture significantly improves resin capacity utilization and maintains performance compared with batch processing. MabSelect SuRe and MabSelect SuRe LX showed comparable performance with respect to clearance of host-cell proteins, leached Protein A, and mAb concentration in the eluent), but under test conditions, the LX resin had about 20% lower binding capacity. Procrastinators will rejoice at the anticipated timeline for adoption of fully continuous bioprocesses. Dr. Phillips predicts commercial viability will take at least 5–10 years due to the complex interplay of economics, engineering, and product availability. 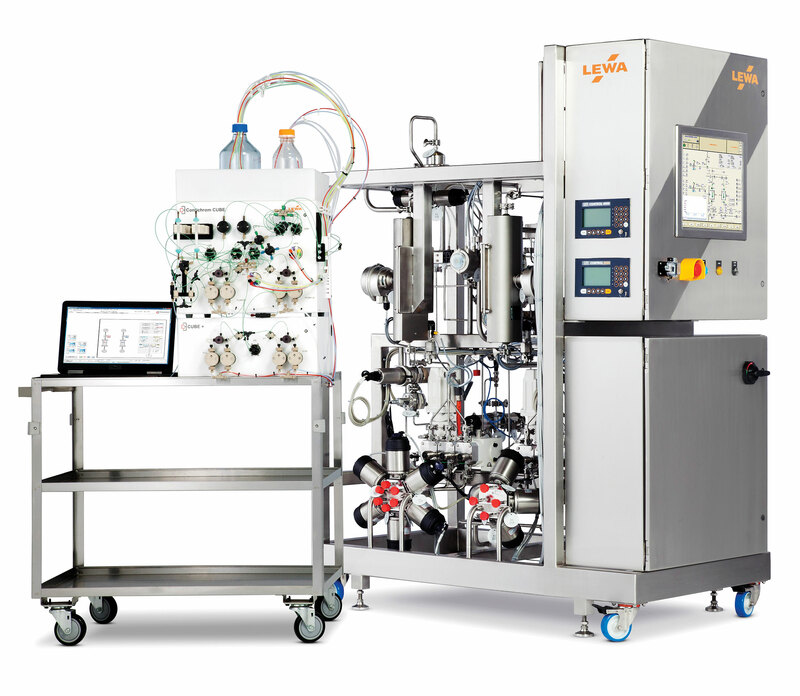 Most commercial cell-retention systems, the basis of continuous cell culture, operate at bench scale and higher volumes, but are unsuitable for volumes below two or three liters, where process developers are accustomed to working. Yet process development volumes for batch cultures are generally trending downward, with the benefits of reduced media and materials usage, a higher degree of parallelism, and lower costs. By contrast, spin filters, which are still available and used in research labs, lack upward scalability. Applikon’s Biosep cell-retention system is a nonfouling device that separates trapped cells from expressed protein product through acoustics rather than size. 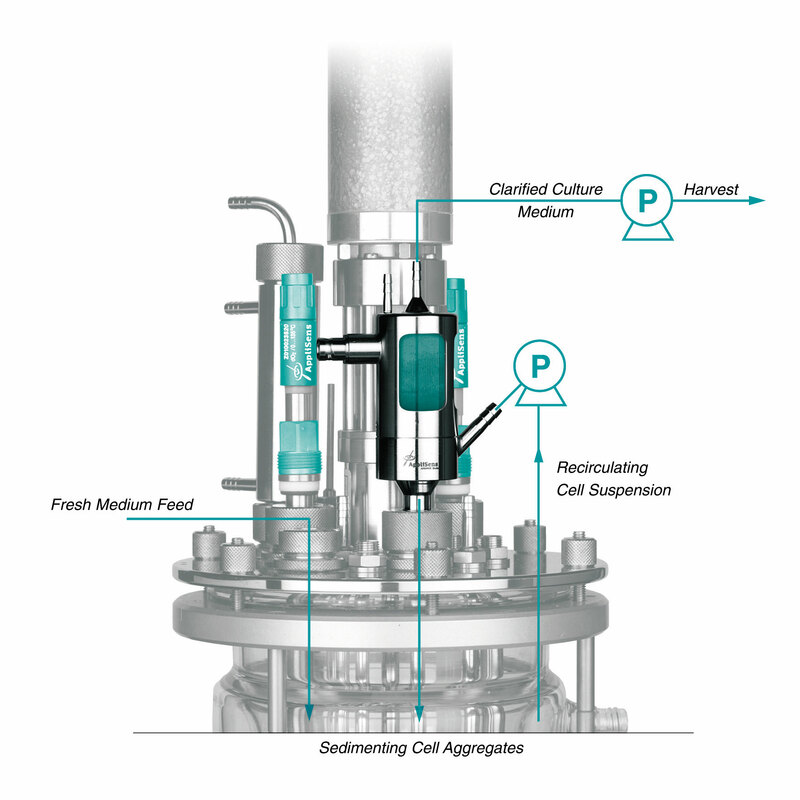 Biosep allows continuous harvest from a perfusion culture, while retaining cells within the bioreactor at an optimal concentration of approximately 100 million cells per milliliter. Continous harvest from perfusion culture may be carried at at laboratory scale with Applikon Biotechnology’s Biosep cell-retention system. 1. ChromaCon webinar, “Pioneering an Approach to Integrated Continuous Bio-Manufacturing,” (June 22, 2017), accessed August 17, 2017. 2. GE Healthcare, “Evaluation of Protein A Resin Lifetime During Extensive Use (Overloading) in Continuous Chromatography Mode,” poster presentation, accessed on August 18, 2017. Read the rest of GEN’s supplement on Continuous Bioprocessing. Continuous Bioprocessing: Is It for Everyone?